A nicely laid out, lightweight, 2-person, 3-season tunnel that really comes up short in the department of wet weather protection. If Hilleberg could work out the issues mentioned in the review below they would have a very nice 3-season rig on their hands. Nice enough that I would purchase one for myself without a 2nd thought. Yellow inner doesn't make you feel like you are in a cave when hunkered down for prolonged periods. 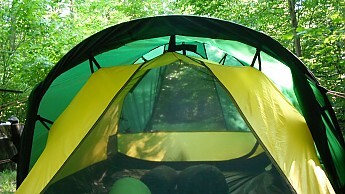 In my personal opinion from experience the tent outer is elevated higher than it needs to be off the ground. 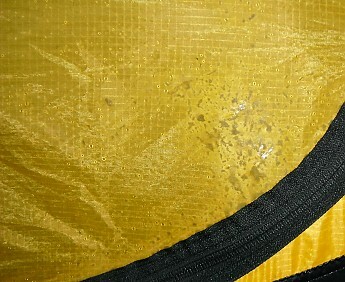 This results in the inner tent sidewalls (yellow area above flooring) wetting out from the splashing effect generated from prolonged, driving rains. 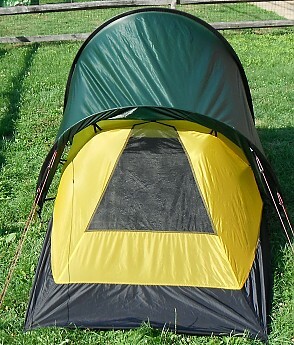 This is dependent upon where you pitch the tent. This does not happen in areas where grass is thick and tall but is a real problem in rocky areas as well as areas where one pitches the tent on bare soil. The lack of a storm flap protecting the zipper on the vestibule. 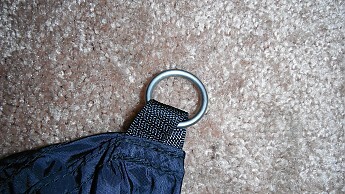 This results in water making its way through the zipper when exposed to extended wet weather. I understand Hille wanting to shave weight but I feel that the lack of this feature is a big no-no. If you place your gear, boots, etc. under the zipper in the vesti area and you get caught in a storm your gear will get wet. Mine did. 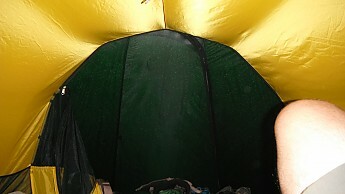 Corners of inner tent leaked after prolonged exposure to rain. The Tri-Pegs are somewhat flimsy and bend fairly easily. I definitely prefer the DAC V-stakes that came with my Soulo. They are most certainly stronger and although they weigh a bit more I would much rather have the V-stakes for my own personal use. 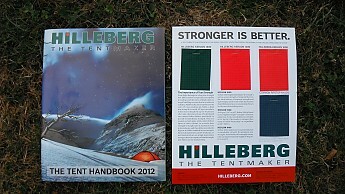 Back in August of last year there was a blog released in regards to well known and respected tent maker Hilleberg was going to start producing 3-season tents. Hilleberg is well known and respected in regards to their 4/all season bomb shelters that they have been producing for the last 40 years. 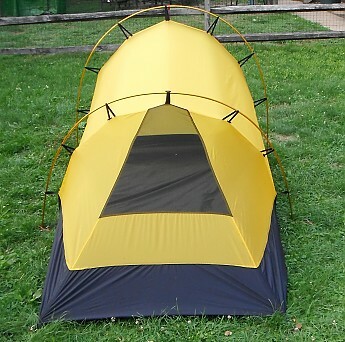 With that being said, I suppose you can understand my reason for excitement when I found out that they were going to start producing tents for milder weather excursions. As you can see in my response on the blog from a year ago I was somewhat confused initially in regards to the price point that was set for these 3-season shelters. ...so for the most part that cleared that one up for me. Well, it is now 2012, Hilleberg's 3-season tents have been on the market for a bit, and I was afforded the opportunity to get my hands on Hilleberg's Anjan 2 for testing and evaluation. I recently took the tent out on a week long trip (my usual) and it was subjected to a few different types of weather conditions. What did I come to find out about the Anjan 2 when it was placed in my hands and subjected to real world use? Well, if you have a little time on your hands and like to read (+ look at pics) you will find out that I have come to learn quite a bit about the Anjan 2.
at opposite end of the shelter: 29.25"
The design of the Hilleberg Anjan is based on its all season big brother the Nallo while weighing in at around 20% less than its beefier sibling. 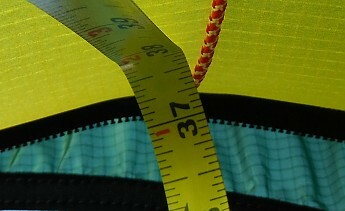 This is Hilleberg's lightest weight version of their Kerlon fabric. As with other versions of Kerlon the fabric is coated 3 times with 100% pure silicone. The fabric itself is 20 denier ripstop nylon and it has an ISO(13937-4) minimal tear strength rating of 10kg/22lbs which is not quite as high as their 1200 and 1800 versions of Kerlon but is still quite strong. 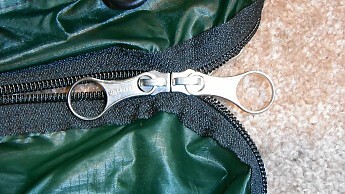 The triple coating of 100% silicone has alot to do with the strength of the fabric. I would strongly suggest that if you are interested in any Hilleberg product to take the opportunity to request a free catalog from Hilleberg. With the request you not only get the catalog, but you will also receive the price sheet as well as samples of the various Kerlon fabrics available (1000, 1200, and 1800,) not too mention as well as a sample of the standard ripstop material that is used throughout the industry. The purpose of this is to provide you with a comparison fabric for a tear strength test. 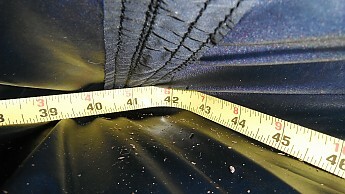 The floor extends 7" up the side of the inner. 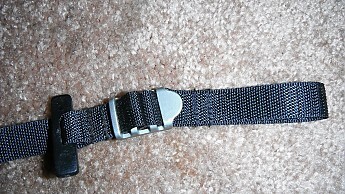 These pockets are adequate for small necessities that you and/or your companion would like to keep readily available inside the shelter with you. 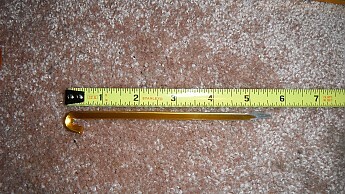 There are 2-9mm poles (of different lengths) that come with the Anjan. As with my Soulo one is marked red. 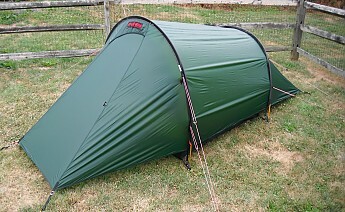 The poles are DAC Featherlite NSL poles and as I have experienced with my other shelters DAC makes a great pole. They are really light but at the same time quite strong. The stakes that come with the Anjan are not what I am use to when it comes to Hilleberg stakes. 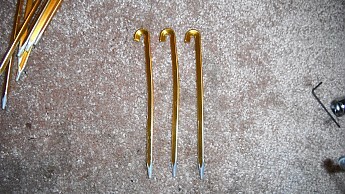 They are what is referred to as Tri-Pegs (as seen in the photo below). When I initially received the Anjan the ground was quite dry(think cement) in my backyard. Like a kid with a new toy I went out to set it up as soon as it arrived. Well, needless to say after I took the tent down I found myself spending some quality time with my good friend "Mr. 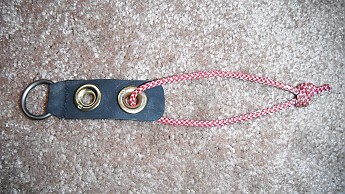 Vise" straightening pegs. 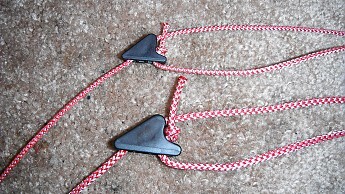 In a way the Tri-Pegs simply remind me of a beefed up, technologically advanced version of a shepard's hook. 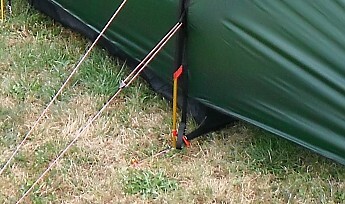 The guylines (as seen in the photo above) on the Anjan are 2mm spectra line and as it has in the past with my other tent the line performed as it should. 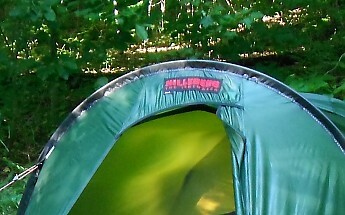 The guylines are strong(132lb breaking strength per Hilleberg,) do not absorb much water if any, and there is not an outer sheath to slip being the line itself is completely interwoven. For specs on the 2mm guyline please click on the link provided here. The smallish size of the runners makes sense being the lines that come standard on the Anjan are 2mm as opposed to the 3mm lines that come on my Soulo. The runners perform as they should. 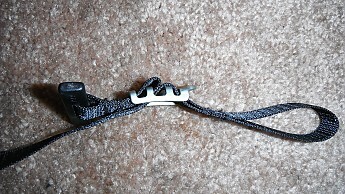 I did not experience any slippage during the time that I used the Anjan 2 regardless of weather conditions. It is quicker to erect being there are less steps to perform to get the tent up. 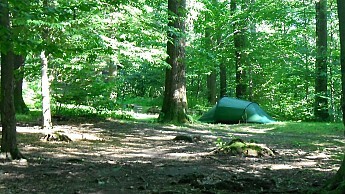 It is much easier (and drier) to pitch the tent in inclement weather. 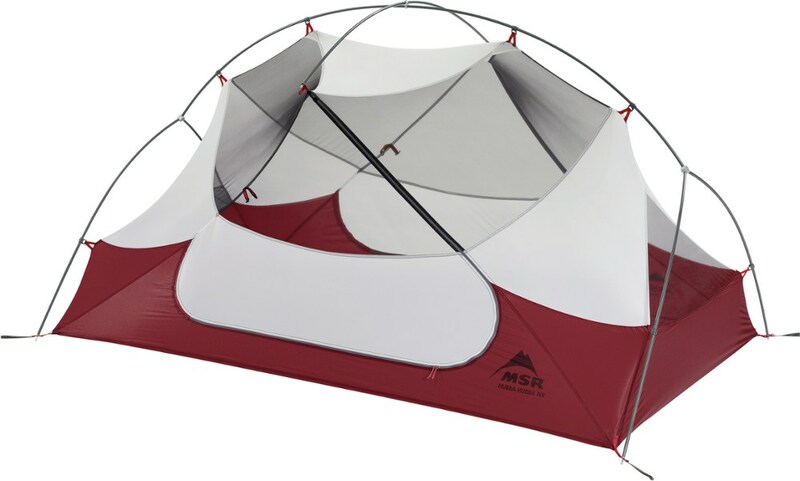 It is also much more convenient to tear down the tent in inclement weather being you can remove the inner while still keeping it dry and then the outer which you can store separately so when you reach your next destination regardless of the weather you have a nice dry tent to climb into. The other pole(which is the shorter of the two) goes into the remaining sleeve which is located at the rear of the shelter. One of the attributes of this shelter that I admire greatly is the flexibility in regards to the different ways the shelter can be erected (as seen and explained in the video). 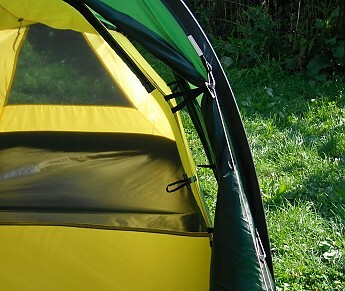 As stated further along in the review you can purchase optional pole holders for an "inner only" pitch but this is not necessary being you could just remove the pole holders from the outer tent and utilize them. These setups are pretty much covered in the video so I see no need to reiterate the whole process here for obvious reasons (making this review any longer than it alread is). If you read (or scroll) further down in the review under "ease of use" I get a bit more in depth in regards to my own personal experiences in regards to setting the Anjan 2 up. Stability during windy weather was quite good. I can't say the Anjan is as solid as my Soulo dome but this is an apples to oranges comparison. The Soulo is a 4 season tent that is fully free standing/self supporting while the Anjan is a non-free standing tunnel that must be pegged out in order to get an optimal pitch. During high winds there was a little flapping of the exterior sidewalls on the Anjan 2 but it was nothing that caused any great deal of concern in regards to the conditions that I subjected it too. The tent did flex a little when exposed to shifting winds(noticeable when the tent was hit broadside) but the Anjan never really caused me any great deal of concern. I found myself wishing that the outer extended another 2" down closer to the ground. This would offer better protection from the elements while still providing adequate ventilation. 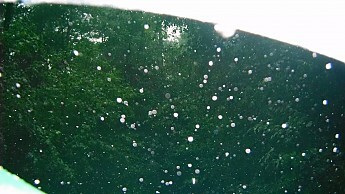 As seen in the photo below the outer is around 5+" off the ground. This was on the entrance/vestibule/door area of the inner. The vestibule was zipped up. 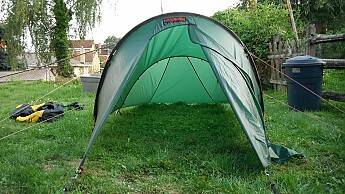 The rest of the tent (inner sidewalls) was actually quite worse. I found this to be less and less of a problem the further you went back because the outer gradually hugs the ground closer as it makes its way to the rear of the shelter. I pretty much spent my evening soaking up the moisture with my MSR Pack Towel hourly. As the storm became progressively worse so did the ingress issues that I was experiencing. The lack of this feature raised an immediate red flag with me and my initial worries ended up being quite factual. 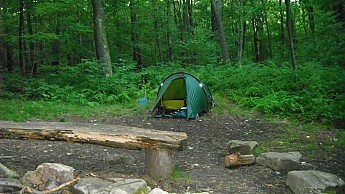 When I had the shelter on trail I was hammered with rain. 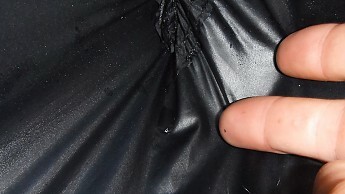 After exposure of 30 minutes+ the zipper actually leaked moisture into the vestibule and onto some of my gear. So with the splashing coming in from the bottom and the shower coming in from the zipper my gear was pretty much being hit with water from all angles. I had shelters reserved just in case something of this nature were to occur. Hey, a backup plan is a good thing and I always have one while solo on trail. I have to say ventilation in the Anjan 2 is very good. With the different ways the shelter can be configured in regards to pitch options that is somewhat of a given. 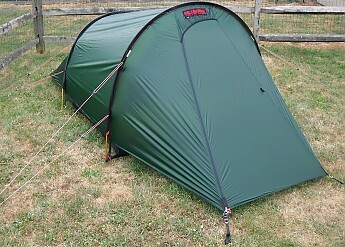 For starters, there is a good amount of space in between the outer and inner tents (see photo below:). 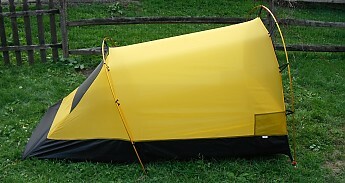 This is to maximize airflow in between the outer and inner of the tent. There is also substantial amount of space in between the outer and ground (overkill in my opinion) as well. You have no-see-um mesh at the entry and foot end of the inner, and if ya want to vent from the top a bit you can. 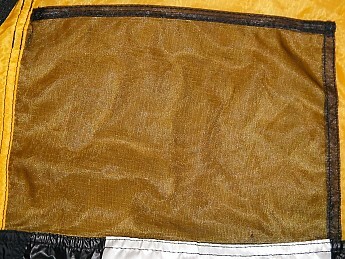 Why Hilleberg didn't extend this portion of fabric to protect the zipper is beyond me. I understand that they wanted to keep the Anjan as light as possible but this whole lightweight thing only goes so far and one has to draw the line somewhere. I personally would much rather have a non leaking zipper and a few more grams of fabric than a shower in my vestibule. I mean if the vesti doesn't protect your gear then what is the point in having one in the first place? As I stated on a previous review packability is somewhat dependent upon the size of your pack which will vary from individual to individual. I utilize an 85L pack so the Anjan hardly puts a dent in the interior volume of my pack. 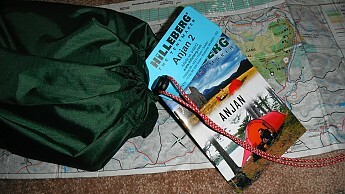 One comment I can make as far as a comparison is that the Anjan 2 packs smaller than my Hilleberg Soulo. If this shelter were to be broken up between two folks it would be quite "doable" to say the least due to the relative small size of the complete "kit & kaboodle" and the lightweight of the shelter itself. After setting up the tent in its different variations in my backyard I found the Anjan 2 to be pretty much a no-brainer on trail. The shelter itself is very straightforward and for the most part simple to get an optimal pitch on trail regardless of what conditions I was experiencing or terrain I was on. If ya read the instruction booklet that comes with the tent itself as well as watch the video above I personally cannot see how one would have much trouble erecting the Anjan. I have personally dealt with much worse. So in regards to ease of use I have to say the Anjan 2 is quite user friendly and straightforward. 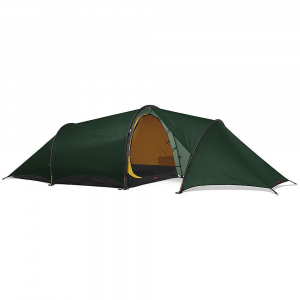 As with other Hilleberg products that I have had experience with there are no abnormalities in the fabrics, stitching, and overall attention to detail that is given to the product from looking at the tent as a whole. I cannot personally comment on durability in regards to a long term perspective at this time(look for a future update,) but I can do so in the aspect of the tent holding up during some pretty gnarly storms. On the maiden voyage of this tent I encountered what might be some of the worst storms I have encountered in the hills here in SW Pa. 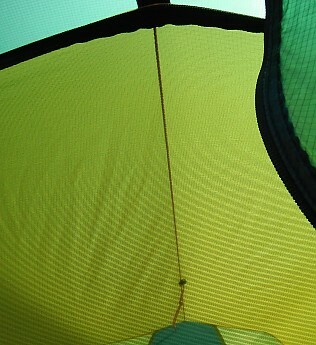 The Anjan did not tear, stitching did not fail, and overall the tent held up in one piece. Other than the issues I have with the Anjan's ability to keep moisture at bay (which is a substantial issue) the Anjan 2 is a solid tent. I utilized the Anjan 2 here in my testing facility that some call the Laurel Highlands on a week long excursion. Well weather was pretty bad at times. High winds, heavy driving rain, a lot of lightning was pretty much the norm for this journey. I did have sunshine and blue skies for a few days, but for the most part it was a pretty wet trip. 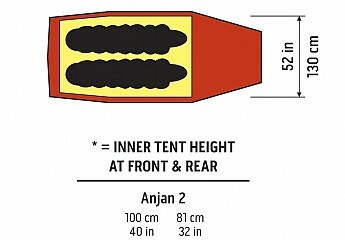 When I first received the Anjan 2 I had really high expectations for this tent. 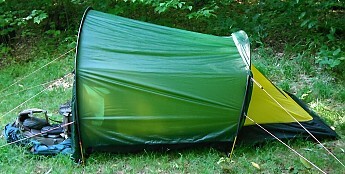 Mind you this was based on prior experiences that I have had with other Hilleberg shelters over the years. As I stated many times before here at Trailspace, I have come to expect a lot out of a product when it carries the Hilleberg name. One of the biggest attributes I expect is that their shelters provide a very high level of protection in regards to shielding me from the elements. ... but to my dismay when it comes to keeping me (as well as my gear) protected from the elements the Anjan 2 leaves a lot to be desired. Let's face it. 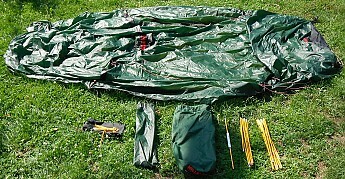 If a tent doesn't protect you from the elements it is nothing more than dead weight in your pack. 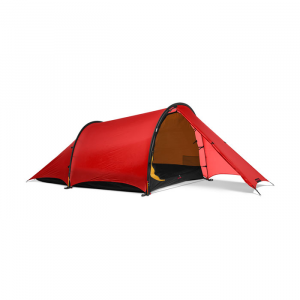 The Hilleberg Anjan 2 is a premium product, comprised of premium materials, that carries a premium price tag. With that I expect premium performance and the Anjan 2 just didn't deliver. The problems I encountered with the Anjan 2 could all be rectified with a little more r & d.
With that being said, I will go on the record to say that if these issues are addressed I will purchase this model for my own personal use. The wet weather performance (or lack there of) just completely kills it for me. 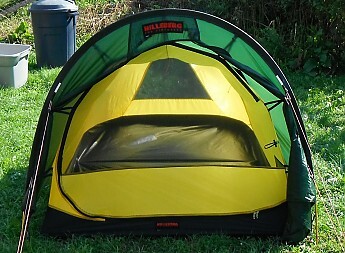 Out of fairness though, I have to take into consideration that the 3-season tent market is uncharted territory for Hilleberg. 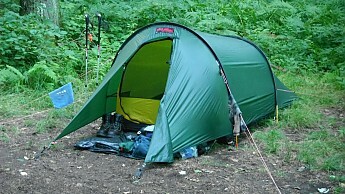 As always I want to thank you for taking the time out of your day for reading my review of the Hilleberg Anjan 2. I hope you have found this review to be informative, not too boring, and I hope the information contained within this review serves you well. Just a few initial thoughts, I may pick you head for more info. 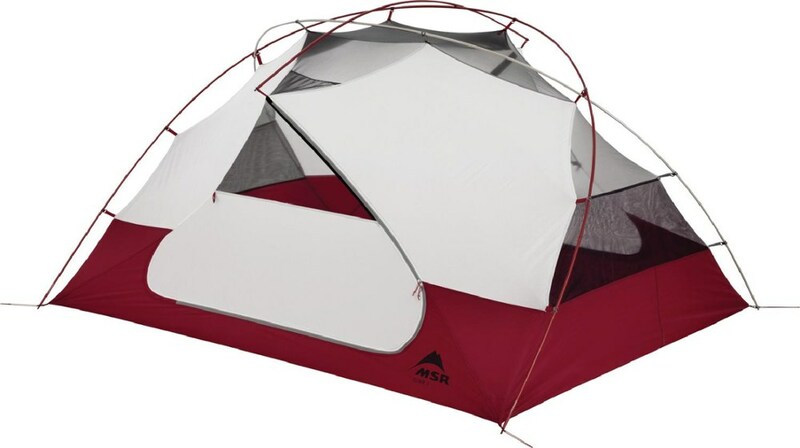 I didn't ask about cost because if you are willing to spend $570 on a tent then you have many, and I mean many options available to you out there. I am getting ready to take the Anjan back out on a 17 day solo trek in the hills for the purpose of updating that review. 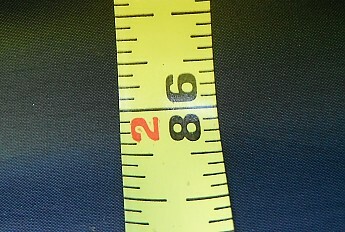 I purchased the footprint for it as well as seam sealed the corners. So maybe this will alleviate the water ingress issues I was experiencing on my last trip... Well at least to an extent being I can't make the outer hug the ground anymore than it does. Look for an update on that review in the coming weeks. I will return around the 12th of July so I should have my thoughts posted sometime around then. I asked hilleberg: "Due to this review I got some doubts regarding the deployment in rainy conditions (I am planning a trip to New Zealand). What is your position regarding this review/issue? Were there some improvements done in order to fix this splash-back problem since then? 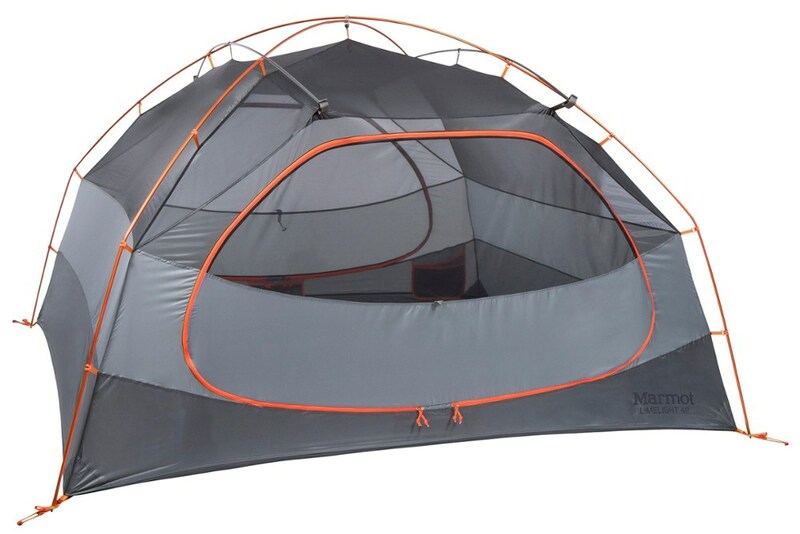 I saw that the tent costs 570$ in the US. In EU it costs 669€ (equals 920$). 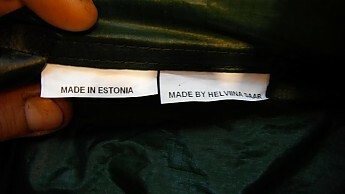 What's the reason for this difference? Thanks in advance for your answer." .... The response from Hilleberg: "The sides of the outer tent is drawn a bit lower on todays models compared to the first Anjan tents. That will protect the inner tent better from hard rain and wind. The US is a different market with a lower price level in general and the prices there are without taxes." 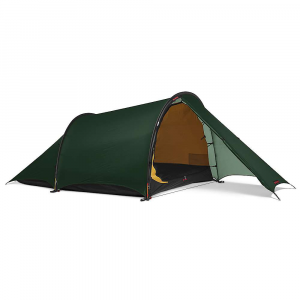 Just used this tent in the Scottish Lowlands and however you try to provide as much ventilation the material is prone to condensation problems on a cold clear September night with no wind. You spend an hour or so drying it out in the early morning sun before starting another section of the walk. 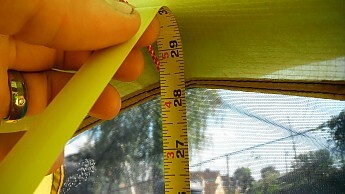 I would not have expected the amount of problems with condensation for a 3-season tent. This is the first time I have used the Anjan 2 and it was in weather where most days were sunny and dry while backpacking. As far as pitching, ease of use, packing, room and storage I really have no issues with. It has not been tried in very severe weather where I live in the Scottish Highlands, and I am reluctant to try it out in any months outside April to Sept. 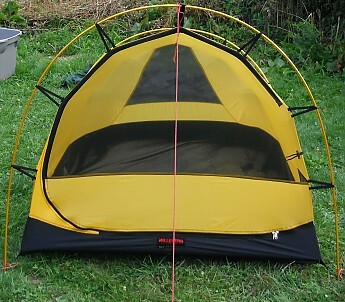 I have had a few cheaper tents for backpacking over the years, like Vaude and Vango, and the condensation problems in those tents were minimal. 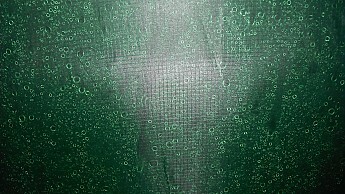 I believe the type of fabric in the Anjan 11 has something to do with attracting the heavy condensation. After a few nights in cold clear skies I started to wish for mild windy nights to keep the condensation to a minimum. It didn't matter how many flaps/vents you left open the problem still prevailed.